The global magazine for the producers of plastic film and sheet. Published nine times per year, it covers developments in polymers, additives, extruders and ancillary equipment. It also analyses relevant trends in the packaging, construction and agricultural markets. 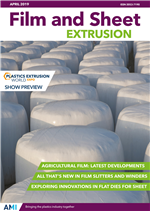 Film and Sheet Extrusion is a digital magazine from Applied Market Information that is specifically written for plastics extrusion companies producing film, foil and sheet products. It covers the latest extruders, dies, downstream equipment, winders and materials handling systems as well as innovations in LDPE, LLDPE, PP, PET, PS, PMMA, PC, bioplastics, barrier materials and other relevant polymers and additives.